In the United States, our healthcare system relies on "teaching hospitals" — more commonly known as "academic medical centers" — for the clinical education of medical students and physicians. Academic medical centers like Erlanger are essential classrooms for training physicians and other healthcare professionals. 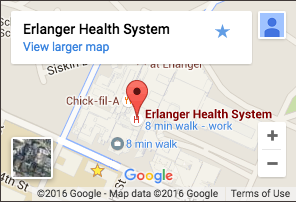 An approved teaching hospital since 1915, Erlanger became affiliated with the University of Tennessee College of Medicine in 1974. Today, Erlanger serves as the main campus for the University of Tennessee College of Medicine Chattanooga (UTCOMC), one of three campuses across the state that are affiliated with the University of Tennessee Health Science Center in Memphis. What are the benefits of having access to an academic medical center in Chattanooga? Thousands of patients and their families have discovered that medical care offered by Erlanger and UTCOMC offers several distinct benefits. First, the academic environment at Erlanger and UTCOMC encourages physicians to seek solutions for patients' problems through medical research. Practicing physicians on the faculty of the College of Medicine stay on top of the latest medical developments. UTCOMC's involvement in research programs provides you with opportunities to participate in groundbreaking treatments that are not available at other area hospitals. Most importantly, studies show that patients at academic medical centers have better outcomes. Academic medical centers like Erlanger and UTCOMC encourage active collaboration among residents, practicing physicians, and specialists. Consultations on difficult medical problems can lead to earlier diagnoses and treatment methods. The teaching atmosphere also attracts specialists to our community, allowing Erlanger to offer services not provided by other facilities, such as a children's hospital and trauma care. Together, Erlanger and the UTCOMC offer a "safety net" for the region, providing essential medical care to the uninsured and underinsured while serving as the backbone and heart of our region's healthcare system.